Academic journals are notoriously difficult to keep up with. They’re locked behind paywalls, update infrequently, and don’t offer very transparent means of notification. As a result, I often find myself feeling out of the loop or oblivious to what’s being published – and when I do happen to spend a couple of hours sifting through journals, I never leave with the feeling that I have gained a broad sense of the state of a discipline. 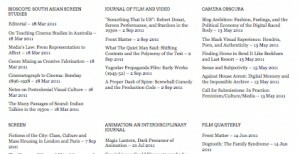 So, to address this problem, I have tracked down the table of contents RSS feeds for a hundred or so journals – concentrated around film & media studies, new media & game studies, visual culture & cultural studies, and theory/critical theory – and basically embedded them in a broadsheet-styled format. The goal is to create a display that allows the reader to scan the essay titles, or “headlines,” from so many journals.